This painting was accepted into the 34th La Cloche Juried Art Show 2011 and earned second place Award in the pastel category. approx. size: 22" x 16"
This painting was created using soft pastels on archival suede mat board. Deer were so plentiful at the park we camped at in Orlando that on almost every bike ride or walk I encountered white-tailed deer. These were wild deer, and free ranging, and yet they were so used to human presence that one could get within mere feet of them. At every opportunity I took photographs of the deer, as well as the myriad of birds and other wildlife that were so plentiful there. 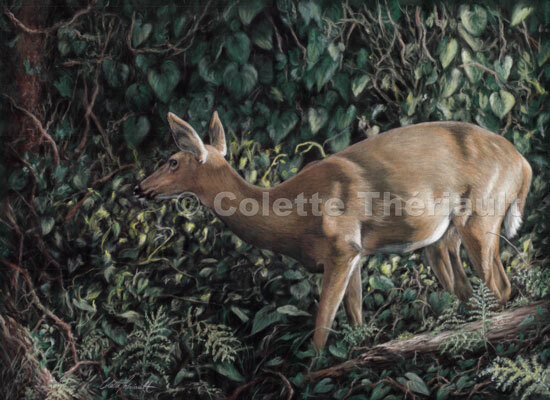 The doe in this painting had heard something in the near distance that made her weary. She was cautious and walking very lightly and softly so as to not make herself heard as she made her way through the densely vegetated forest. I loved how the fading Florida sun shinned on her coat and so I decided to paint her elegant figure.